Li Yue Wen was born in Guangxi, China. He was diagnosed with osteogenesis imperfecta (OI), also known as “brittle bone disease”, a genetic disorder where the patient has fragile bones. He had multiple fractures in his early childhood, with marked deformities over both lower limbs and left femoral fracture, which was operated around 2013 in Tianjin, China. 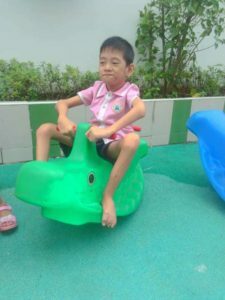 Unfortunately, Li Yue Wen’s deformities over his right femur and both tibias were left untreated, which resulted in him not being able to walk. Li Yue Wen had not been able to walk for nearly 3 years. To strengthen and assist him with walking, he underwent a long treatment plan, with expensive medical costs. Li Yue Wen wants nothing more than to be able to attend school after he is able to walk again. However, his family was financially exhausted and could not afford the treatment. In addition, due to the severe bowing of Li Yue Wen’s leg, he suffers abrasion and feels pain at mid-shin, and surgery had to be executed quickly, delaying the surgery till the end of 2015 would cause further deterioration of the leg. With the sponsorship of the SRDC, Li Yue Wen arrived in Hong Kong in May 2015 and conducted a major surgery on his femur and both tibias. Li Yue Wen was treated with multiple osteotomies over his right femur, which was stabilized with Telescoping rods, and multiple osteotomies over both tibias, stabilized with Rush pins. He was then put in a cast for about three weeks before he got bracings. This major surgery will enable him to walk in the future. The surgery was completed successfully in May 2015. Since then he had been doing daily physiotherapy at the Duchess of Kent Children’s Hospital. After two months at the end of July of the same year, he was able to walk and left Hong Kong back to his home in Dongguan, China. Li Yue Wen now goes to kindergarten in Dongguan. He learnt how to ride on a tricycle. Moreover, Li Yue Wen is able to walk further but has grown up and gained some weight. Within half a year, he has gained 6 pounds. Yue Wen is very thankful for the help and support you have given. Yue Wen and our family wishes you all the best and happy Christmas.